This week's Next 20 community builder is Michael Harris, a BC–based writer, journalist and editor. His work has been published in Wired, Huffington Post, The Globe & Mail, The National Post, The Walrus and beyond. In 2014, Michael won the Governor General's Award for his book The End of Absence where he describes how technologies influence us and future generations—and the way we interact with ourselves and inevitably the world around us. I've always wanted to be a writer. That moved slowly from being a poet in junior high, to a novelist in high school and university and then to a kind of weird literary mash up today. Those genre distinctions don't really matter to me anymore. Today I write work that is memoir/journalism/fictive. I remember immediately feeling like an outsider from preschool on. I was never good at sports but I was a very precocious and literate child. Before I even went to preschool, my mom, who was a teacher, was already teaching me how to read. I was always aware of being put into special classes, which was not always a good thing because I was being removed from my cohort. Since Grade 1, I really had a sense that writing was my way of mitigating any feelings of outsiderness because it made me feel like I was part of a larger conversation. Do you remember a favourite teacher? Why were you drawn to this teacher? I had Mrs. Nielsen for Grade 9 English. She was very inspiring and probably gave me too much praise. She ran her classes like salons. English wasn't just something to learn but also to engage with. I liked that it invited you to lean forward on your chair. What subjects or parts of the curriculum were you drawn to? In Grade 1, we would have time to write short stories. Everybody else would have one page of foolscap paper that they would be writing their story on—and I had a stack of papers and a tape dispenser. I would tape the pages together like a scroll and write until the paper hit the floor. It was a nerdy baller move for Grade 1. I took piano lessons from 4 to 18 years old. That was important because school was really easy for me and my mom recognized that I needed that challenge. Along with reading and writing, music is the largest piece of my education that I'm grateful for. Creativity is innate to all of us. You don't have to be an artist or musician; someone who daydreams when they pour their coffee is being creative on some level. It's part of all of our lives. Creativity also needs space and time. This morning I wrote 400 words of a young adult novel that I'm working on. I would never try to write more than 400 words because I would just burn out. The rest of the day is about "gathering firewood", research and incubation. When I do my writing, everything by necessity is literal. Sometimes you point toward the unsaid, but you're really wrestling with that border of what can be represented. When I'm writing, I compose in a musical way, a little bit. When I think of music, it expresses what we can't express in the literary world. Music gives me the flip side of representation. When I write, I will often understand that a sentence requires a few beats at a certain point in a clause and I won't know what goes in those beats. Often, I'll be writing a paragraph and the sentence will go something like: "The National Ballet of Cuba when TK TK TK TK TK was at its peak." The TK is journalistic term for "to come". The TKs represent beats that are placeholders for literal meaning. There's a sensibility and musicality to the phrase that I enjoy. In a way, musicality comes first and the literal meaning comes next. That isn't how every sentence gets constructed, but often there will be a directive from some part of my brain that says that sentence requires this kind of rhythm. Having something to say. That's actually something that I just figured out this year. For a lot of my creative life, I have been trying to create beautiful things without actually having something to say first and that creates a lot of heartache because you can't create something beautiful without having a reason to. 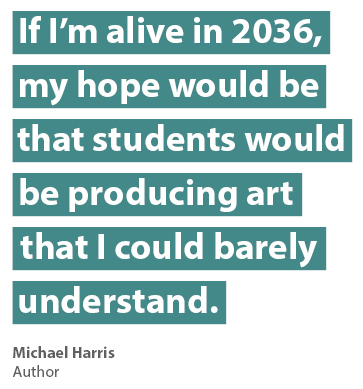 If I'm alive in 2036, my hope would be that students would be producing art that I could barely understand. I would hope that they were using elemental tools to engage with the world in a unique way and that they were producing work that is uniquely reflective of the world that they grew up in. I would hope that some of that work would be beyond me and some that I can barely hold on to. At ArtStarts in Schools, we want to ensure that young people across British Columbia have opportunities to develop their creative potential and to build skills to thrive in the next 20 years—and beyond.